Update: These offers for the Starwood Preferred Guest® Business Credit Card from American Express and the Starwood Preferred Guest® Credit Card from American Express have expired. Learn more about the current offers here. As y’all know, Lufthansa has one of my favorite first class products in the world, though it’s becoming progressively more difficult to book it with miles. That’s not just because they’re releasing award space to members of their partner frequent flyer programs at most 15 days before departure, but also because of the ever decreasing ways to redeem miles for it. One of the fun things about our “hobby” is the landscape is constantly changing and evolving. Up until 2011, for example, Air Canada’s Aeroplan program offered first class awards between the US and Southeast Asia for just 120,000 miles roundtrip. Without fuel surcharges. Granted, it was more challenging to come up with 120,000 Aeroplan miles than it is now, and they now allow one-way awards, products are better across the board, etc. So while I certainly wouldn’t mind redeeming miles at 2011 rates again, I think it’s more important to focus on current opportunities. As there have been changes and devaluations to various partner programs over the past year the “best methods” for securing Lufthansa first class seats using miles have changed as well, so I thought it might be helpful to go through the various options. It is worth noting upfront that with the exception of United, all these options include some quantity of fuel surcharges — typically we’re talking about $400 each way for Lufthansa transatlantic first class. You can also use a cash-back card to help subsidize fuel surcharges, like the Barclaycard Arrival Plus™ World Elite Mastercard®. This is another great option for booking Lufthansa first class awards with miles, given Singapore is now a transfer partner of all the main flexible points currencies. 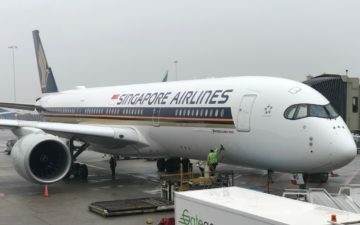 If you want to redeem fewer miles and possibly get a better in-flight experience, keep in mind that Singapore Airlines also has two routes between the US and Europe — Houston to Moscow and New York to Frankfurt. Either of those routes would cost 57,375 miles one-way in first class, plus about $200 in fuel surcharges (actually lower than what Lufthansa charges). It’s worth noting that those costs factor in the 15% online booking bonus. The biggest argument in favor of using United miles for Lufthansa first class is they don’t levy fuel surcharges on award tickets. If you are miles-rich and cash-poor, this might be a good option, but I think Singapore is likely the better choice for most people with Ultimate Rewards points. Ultimately 220,000 miles for a roundtrip first class ticket between North America and Europe is just painful though. If you want to use miles for Lufthansa first class, the best value nowadays is going to come from Air Canada Aeroplan, or Singapore KrisFlyer. If you want to be able to book in advance or on “tougher” routes then Lufthansa’s Miles & More program is also a good choice, but I see very few circumstances in which it makes sense to book Lufthansa first class through United anymore, given there are so many better options. What do you think? What miles would you use? I think they don’t want me so I don’t want them. I’ve heard enough negative stories about how they treat folks that don’t fit there idea of who should be in F to not want to test it. Admittedly, could just be sour grapes on my part. In your opinion, has the partner availability changed over let’s say the last year? It is easier or more difficult to find availability or has it remained the same? I haven’t looked in a while, but have some flights coming up that I might have to change. @ Papa Smurf — I’d say roughly constant. On one hand there’s a lot less competition for those award seats because there are fewer good ways to book, but on the other hand Lufthansa is in the process of cutting first class from 30% of their longhaul fleet, so there are also fewer first class seats. You mentioned the Lufthansa Miles & More credit card, and said they offer “generous” signup bonuses. But the card I see only has a 20,000 mile signup bonus (plus 15,000 miles if you do an expensive balance transfer, which usually isn’t worth it). Is there a card I’m missing, or do you consider 20k miles generous for Lufthansa? @ MarcusBWI — It’s not a good bonus right now, but there’s frequently a promotional 50K sign-up bonus. Usually at least a few times a year. A little unrelated, but is there any possible way to book a Swiss F award. Is it possible to status match and book with miles & more miles while you have temporary status? @ peetyrd — Hmm, don’t think they status match to Senator at the moment. But if you can find a way to get at least Senator then you could book Swiss first class using Miles & More miles. 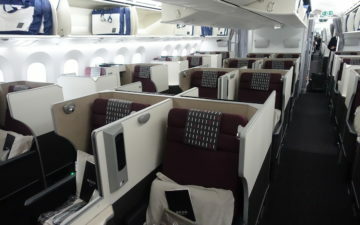 Thanks a ton for your various posts on Lufthansa First Class! I have to fly back to the states from Europe this week and am looking to fly in First. Which Lufthansa plane is your favorite for a First Class redemption? I’ve been look for 2 Lufthansa F out of the US on a 747 for the last 2 weeks, so YVR, DEN, ORD, LAX, SFO, BOS and only found seat out of BOS. I was looking for Aug 2 or 3, I live in Seattle so taking a BOS>FRA wasn’t the ideal choice. Been finding the availability very difficult to come across. @lucky – Are that many senators booking F awards or is there that much paid F to need to limit award bookings? I have to imagine that Many flights in F are going out with many empty F seats. @ Jason Chang — I’d keep monitoring, a lot of space is only released within a few days or a week of departure, so I’m sure something will still open up. Does Miles & More allow US-Asia awards via Europe? Any idea what the fuel surcharges are like when comparing Aeroplan to Miles and More? I’ve redeemed for Lufthansa F through Aeroplan before but if Miles and More has lower fuel surcharges it might be worth it. Any insight would be very helpful! One thing to note, is that UA charges the same number of miles for F to Europe, as it does to Japan, and you can route through Europe with a stopover there making it a mini-RTW. Ive been waiting for a post like this!!! But then you dont give us HOW MANY MILES for each different airline it takes to get on Lufthansa first class (except for United) … Why not post a comparison? You say Aeroplan is better compared to United… but by how much? I guess I’ll go look it up and post it in comments..
One thing missing from this post is a comparison of the fuel surcharges various programs charge. You say that the SQ charge on its own metal ($200) would be lower than LH but it would be helpful to see some examples for all three programs on LH metal, the subject of this post. Does Miles & More allow a 5-day hold without having the requisite miles (i.e., while waiting for SPG transfer to post)? How do you search Miles & More availability on LH’s own flights? I made an account a while back, but it won’t let me use it for anything. Do I need activity first? Sorry if this has been answered in the past in another post: if I have an award reservation on LH in J, and a few days before the travel F becomes available, can I pay the mileage difference to upgrade or does the J booking have to be cancelled and F rebooked? Does it depend through which program the award was booked? Thank you! Are there differences between the IFE’s on 744, 748, and A380? I’m speaking only to the new first class product. Great post! I am coming at it from all four directions you mention and plan on testing out this service in the next year…….and now if AMEX would just run another Aeroplan or KrisFlyer bonus offer………….. Between my SPG card and the Lufthansa CC, I have nothing to worry about finding any FC seats on LH. Yeah, the fuel surcharge is high, however, being able to find seats when I want them and not stressing if 2 seats will open is worth the price. People UR points are great, but not to redeem them through UA’s program. SQ is a better way. @ Moler — I believe so, rates are just so high! @ DCanada — They should be identical. ~$850 roundtrip for first/business class. @ Jay — If redeeming miles for travel on Lufthansa, the fuel surcharges will be the same regardless of whether you book through Aeroplan, KrisFlyer, or Miles & More. @ Kirby — Yep, unfortunately you do need some activity to search space. @ audrytec — Depends on the program. With United you can pay the difference in miles, while with the other programs you have to redeposit and book again. @ Ron — I believe the A380 has a more extensive selection, though it’s still not great. @ Aaron — Sorry, have never tried that, so am not sure. 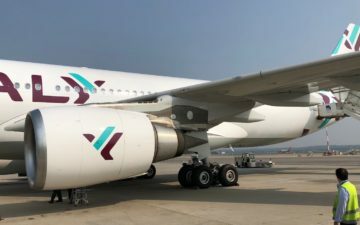 In the case of a mixed cabin award(as Business Class being the highest class of service in the first segment of the itinerary), do I get Business or First for checkin and ground services? @ Norman — First class ground services, if you’re connecting same day. @ Norman — All depends on the airline, you’d have to give specific examples. If flying Lufthansa the whole way it’s true. Otherwise depends on the airline. So I’ll be flying CX in Business departing HKG and then connect to QR in First. As I’ve heard CX has a really decent First Class check-in facility as well as lounges in HKG which I’ll be thrilled to experience, though unfortunately couldn’t grab a First Class seat on CX as they only operate Business on that route. Appreciate the Lufthansa posts as I am planning a Europe trip next summer and already have 2 SQ F booked for the return (FRA-JFK) so want to try LH first on the way there but given set travel dates it’s a little risky. How quickly are miles redeposited with Aeroplan or Krisflyer cancellations? I was thinking I could book an SQ or SN outbound and then switch into LH if the right flight opens up. @ Chas — With Aeroplan it can be done instantly on the phone, while with KrisFlyer it takes a few days, so I’m avoid them for something like this. Last August, I booked Lufthansa First from Tokyo to Frankfurt and Frankfurt to Delhi using ANA miles. They have the best Star Alliance award search and booking engine hands down. ANA also allow transfers from Starpoints which post within a week. A First Class round trip ticket on Lufthansa to from USA to Europe start at 100,000 miles. As far as I know ANA doesn’t block seats. Why no mention of Asiana? Lucky – I see pretty decent LH F availability from the US to FRA for next weekend on expertflyer, but don’t see any award seats. Will LH release the rest of the seats like Cathay does (I seem to recall reading on your blog that LH doesn’t do that) and if not, will LH put back a cancelled award seat into award inventory? @ mangoceviche — Yes, they release a vast majority of their first class award space within a week of departure, so if you keep monitoring it’s very likely that space will open up.